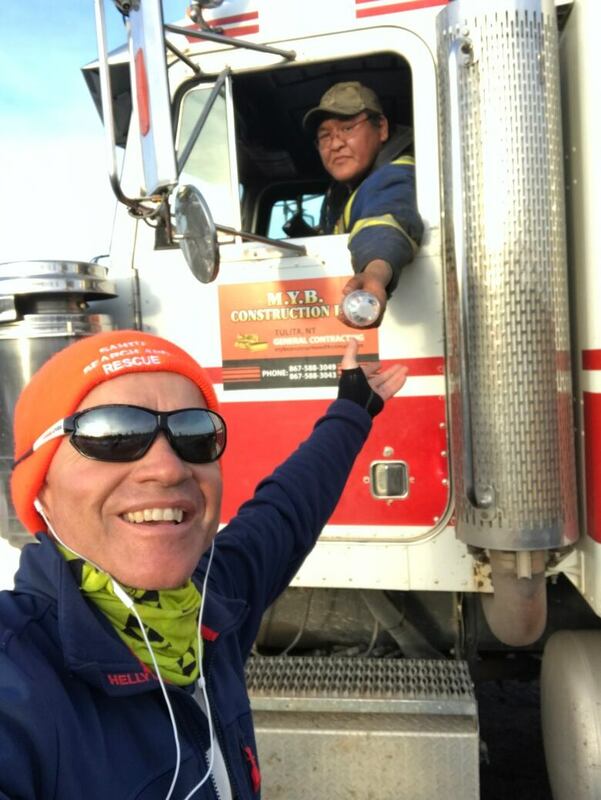 When Laval St. Germain decided to ride his bicycle from Yellowknife to Norman Wells to donate money to a local search and rescue, he knew it would bring up emotional memories of the endurance bike rides he used to take with his son Richard. Laval St. Germain made journey to donate $5,000 to Sahtu Search and Rescue Society in Norman Wells, N.W.T. 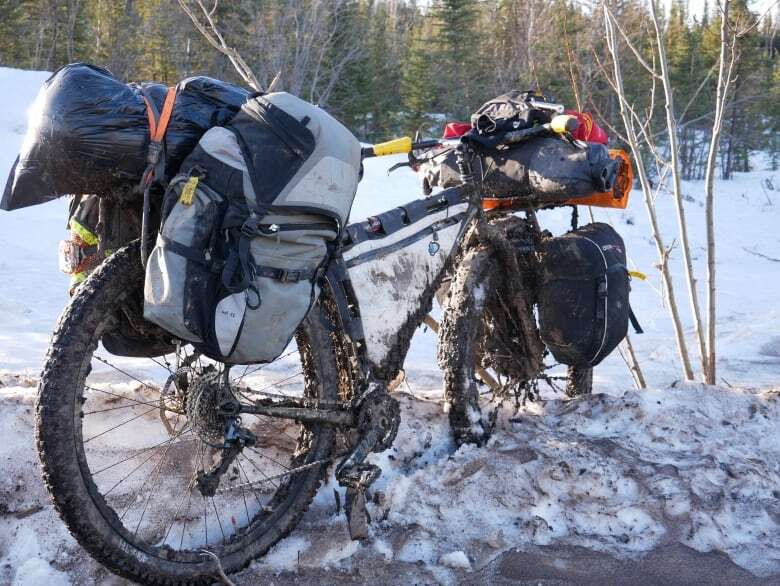 The mud was up to Laval St. Germain's ankles and his legs struggled to force the pedals on his bike forward on a 1,200 kilometre trek from Yellowknife to Norman Wells, N.W.T. It was a stark contrast from a week earlier, on March 8, when he left Yellowknife with paved roads and temperatures hovering below -20 C.
The mission for St. Germain, a well-known adventurer and pilot from Calgary, was to deliver a cheque for $5,000 to the Sahtu Search and Rescue Society, to be used for this year's expenses. "It'll all be worth it, every single pedal stroke, and every single penny, if we save one life," St. Germain said. The death of Laval's son Richard's nearly five years ago started this journey. According to local resident Jaime Kearsey, Richard's death transformed the fabric of Norman Wells. Richard had moved to Norman Wells in 2014 to work as a bush pilot. The 21-year-old lived there for only three weeks before drowning in the Mackenzie River after the canoe he'd been in capsized. Richard's death heightened awareness about how the community wasn't equipped for quick rescue responses, and the Sahtu Search and Rescue Society was formed to remedy that. Jaime Kearsey is now the rescue society's president and said losing Richard was hard on the whole community. She was a server at the Heritage Hotel when Richard moved to town, and they saw each other daily when he'd come in for meals — including the day he died. The two said goodbye and that they'd see each other the next day. That was the last time Kearsey ever saw him. Laval knew that at the end of his bike ride, not only would he be giving his donation, he'd be meeting a woman who could recount some of the precious last moments of his son's life. 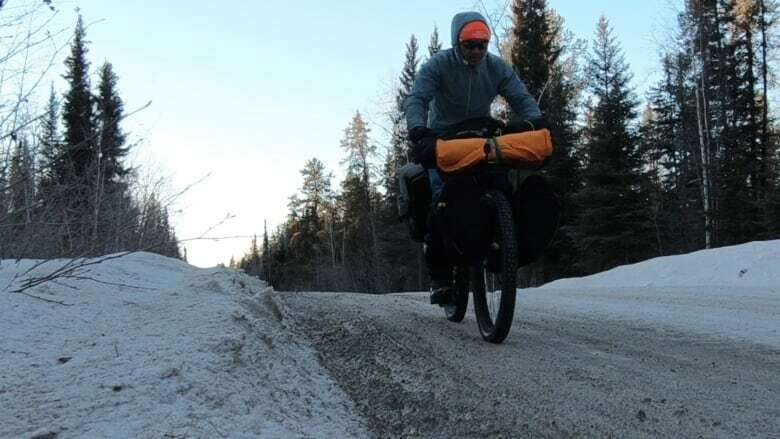 Laval's decision to bike may seem a dramatic way to get his donation to the society — but for a man whose son picked up his love of adventure, biking 900 kilometres from Dawson City to Inuvik with his sister and father when he was 13, biking is a form of therapy that keeps Laval feeling connected to his son. Returning to the Mackenzie River on March 19 and biking across the frozen body of water years after searching that same river for his son was emotional, Laval told CBC over the phone from the hotel room he was staying in at Norman Wells. "I'm actually looking at the Mackenzie now. It's frozen solid but I'm looking right at the river where he went into the water and it's, it's a bit horrifying. At the same time, I think it's necessary to do that," Laval said. When Laval arrived in the community, Kearsey was there to welcome him, as they met for the first time. The two had emailed and talked over the phone for years as Laval made donations to the society through the memorial fund he started for his son, and as he spearheaded a program where he donates life jackets to place around the Mackenzie River to prevent drowning deaths like his son's (Richard had not been wearing a life jacket when he drowned). Over three years, Laval got updates from Kearsey on how the rescue society was building a solid team, received big river rescue and wilderness first response rescue training and purchased rescue equipment. But this face to face interaction was different. "We cried a little, laughed a little," Kearsey said. "It was an amazing moment for me to be able to show him that out of his big loss something big and amazing was and is happening this far North." Kearsey said it would be hard to describe how much Laval means to her community without crying. "He's a great guy," she said. 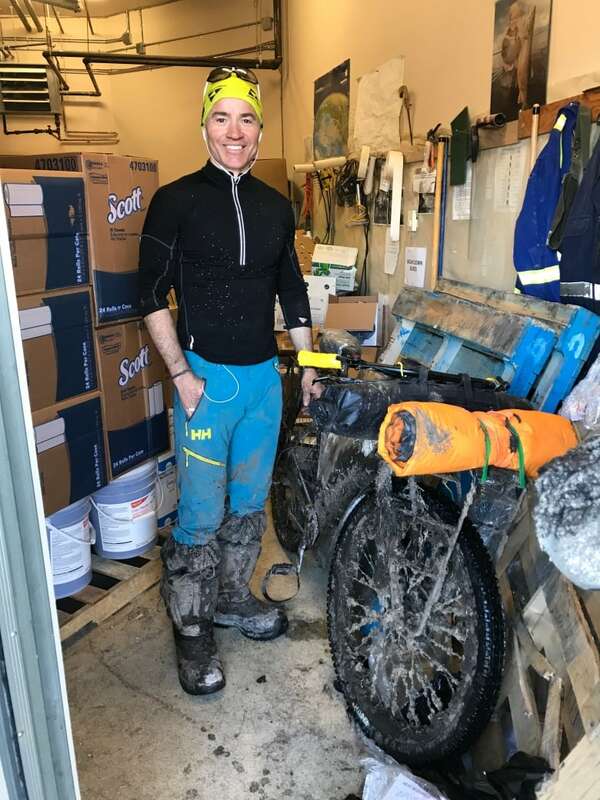 Laval's trek, over pavement, gravel, ice and "ankle-sucking" mud, highlighted the kindness and friendliness he loves about the Arctic. "A lot of them think I might be nuts for riding in the winter time … but at the same time they just take me in," he said. Just some of the kindnesses that struck him: a truck driver dropping his bagged lunch out his window into Laval's hands, and a Dene woman who lived in a tiny cabin near Laval's path served him hot tea and a smokie that Laval describes as "one of the best meals I ever had." With his trip now complete, Laval opted to fly back to Calgary rather than ride. That decision has proven to be especially wise with the record-breaking temperatures that have hit much of the Northwest Territories over the past week. The rescue team will be doing emergency medical training an buying new equipment and supplies with the money Laval provided.